JVN develops and supports custom systems for injecting keys into PIN Pads that are used in the Canadian Interac debit card system and in customer-selected PIN systems. 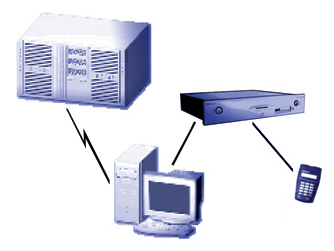 A typical injection system consists of software running on a PC (under Windows 2000 or XP) and a hardware security module. The PIN Pad to be injected is connected to the hardware security module. Keys are generated inside the module and are injected directly into the PIN Pad. The keys are then encrypted in the module and are sent to the PC for storage in a file and eventual upload to the host computer that will process transactions from the PIN Pad. By connecting PIN Pads directly to a hardware security module rather than to a port on a PC, we avoid the potential danger of the keys being exposed while they are in the PC. Injection of keys is under the control of two people, using the dual-custody principle. Each person authenticates herself or himself to the system using the challenge-response method of authentication and injection will only be allowed after both persons have signed on. Other devices can be supported as needed. We are able to work from the manufacturer's specifications to produce a turn-key key injection system according to your environment and the requirements of the host computer system.